Adult Cat Fleas (Ctenocephalides felis) live exclusively as parasites of warm-blooded mammals and birds. There are in fact several different types of fleas, including dog fleas, cat fleas, and human fleas. While each of these species tends to prefer a single host species, they will all feed on other animals in the absence of their normal host. The cat flea is by far the most common flea species, being the cause of over three-quarters of all flea infestations. As with most insects, cat fleas are born in a larval stage. They then enter a pupa when they are ready to mature and emerge as fully grown adult cat fleas. While in this pupal stage, fleas have a high degree of protection against insecticides. 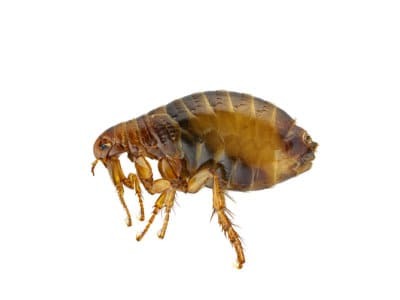 Furthermore, fleas can remain in their pupae for up to a year at a time, so an infestation could easily return at a later date even if you think it has been dealt with. From an evolutionary point of view, the pupal stage allows fleas to survive adverse environmental conditions, as flea eggs and larvae are susceptible to drying out or dying in hot or cold temperatures. Fleas remain in their pupal stage until they detect the presence of a potential host. Vibrations, light variations and increasing carbon dioxide levels from our breath are all ways that cat fleas sense a host. When they do, they act remarkably fast, emerging from the pupal casing within just 3 seconds, jump onto their host, and take an immediate meal of blood. This ability gives rise to the phenomenon of the sudden appearance of large numbers of fleas to anyone entering an empty building. Cat flea (Ctenocephalides felis) bites are identified as a tiny dark red spot surrounded by a reddened area. These bites will persist for one or two days and can be intensely irritating and carry a social stigma. Bites most commonly occur on the ankles and may consist of 2-3 bites in a row. The degree of reaction to bites varies considerably from person to person. Although many people assume that cat fleas spread diseases, there is little evidence to suggest that cat fleas transmit any harmful diseases to humans. Far more significant is the highly irritating nature of flea bites. Many people find these are nothing more than a small, itchy mark, but others can experience an extreme reaction as shown in the image below- especially children. Cat flea bites are often focused around the ankles, since this is roughly the height that the pest insects can jump, and there will often be a gap of bare skin here that the fleas can bite. Another significant issue with cat fleas is their ability to remain dormant in buildings over long periods. It is not uncommon for properties which have remained empty for up to a year to suddenly break out in a cat flea infestation for apparently no reason. As mentioned earlier, this is because flea pupae can remain in a dormant state for a considerable length of time until they detect the presence of a new host. Even if pet bedding has been disposed of in an attempt to eradicate fleas re-infestation will occur unless extremely thorough cleaning is carried out. It is likely that unnoticed pupal cases will remain within the carpet just waiting for some form of stimulation from a potential host to emerge and start the cycle again. Treatment is the only effective method of controlling cat fleas activity- so if you detect any signs of a flea infestation, it’s time to call in expert pest controllers. At Pest Solutions our highly skilled and expert team of pest control service and support staff are ready now to help eradicate those unwanted guests. Cat flea infestations can be particularly troublesome to eliminate, but our technicians have the equipment and know-how necessary to deal with these situations. 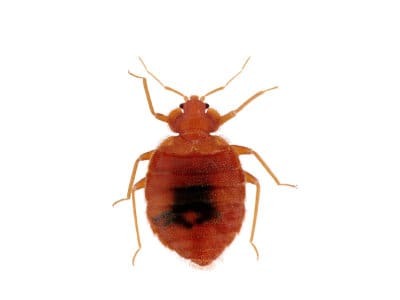 Have our qualified professionals resolve that Pest problem today. Our Local coverage from our regional branch offices helps ensure that we are able to react swiftly so that you can claim back your office or home from those unwelcome visitors. Dial Freephone 0800 027 2555 for a FREE pest survey or to arrange a treatment visit. Find your local Pest Solutions branch.